Chelsea lead the Premier League by six points and are guaranteed to be top at Christmas, but the Blues are not resting on their laurels. Title-favourites Chelsea hope to strengthen their already-excellent squad in the January transfer window by bringing in Paris Saint-Germain midfielder Marco Verratti. According to the Daily Mail, a £30m offer is on the table and, although PSG want more, Chelsea are confident of getting a deal done, probably costing less than £40m. Verratti, who celebrated his 24th birthday last month, has been in Paris for four and a half seasons now, winning four Ligue 1 crowns and five domestic cups. It would make sense for the former Pescara man to seek a new challenge and a move to Chelsea would certainly be a good test for him. 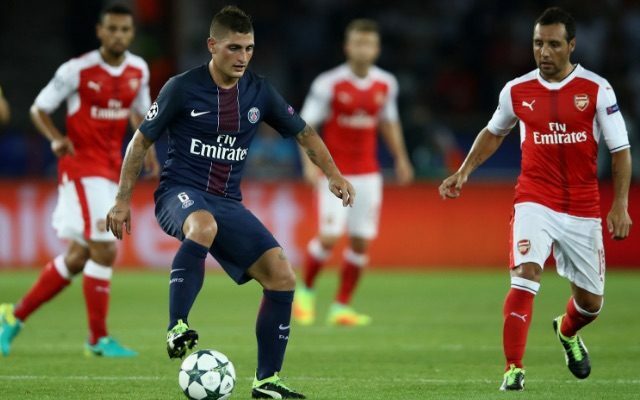 Although just 5′ 5″ in height, Verratti is unlikely to be fazed by the physicality of English football. The 19-time Italy international is strong, aggressive and fearless when it comes to tackling. However, he is also excellent in possession, with a tremendous passing range and a fine first touch.